There’s no doubt about it, dinnertime can be one of the most stressful times of the day for families. 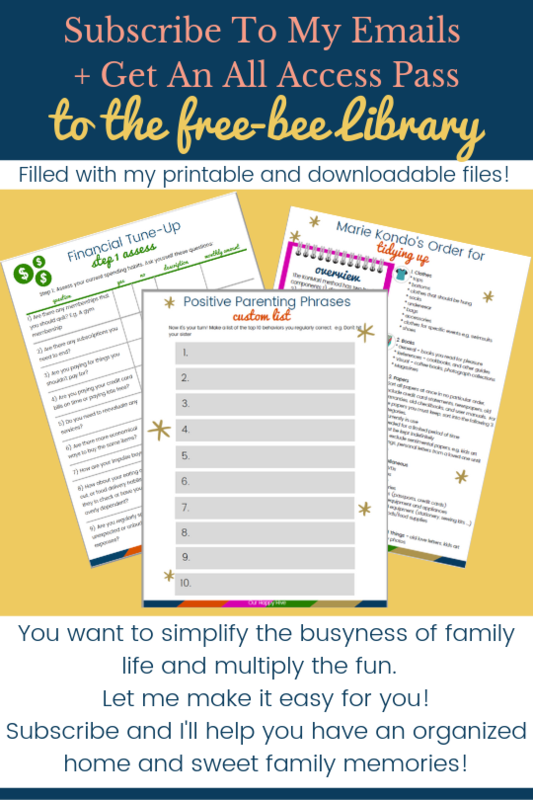 I’m consistently on a quest to end the stress and make the most of our family dinner. One of the most effective tools I’ve used is batch cooking. There are a variety of ways you can do batch cooking depending on how much time you can dedicate to the prep. 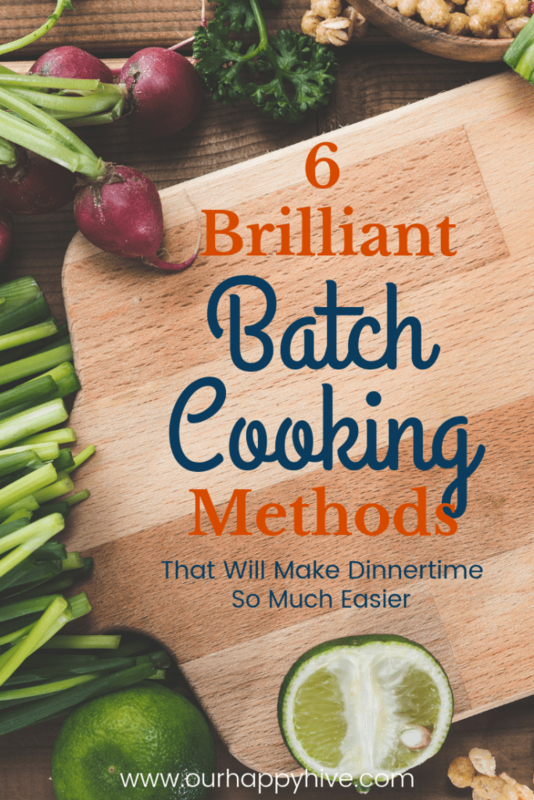 Read on to learn about 6 different batch cooking methods! Wait, what is Batch Cooking anyways? First of all, let’s discuss what I mean by “batch cooking.” In the simplest terms, it’s prepping or cooking IN ADVANCE more than one meal at a time. While that may initially sound like it’s more work, the truth is that it actually saves you time. Also, because you do it in advance, you can choose the most optimal time of the week that works best for you. In other words, it doesn’t have to be done at dinnertime, or at least the majority of it doesn’t have to be done then! Woot woot! How much time does Batch Cooking Take? Batch cooking can take anywhere from 30 minutes to a full day. The different batch cooking methods require varying amounts of time. Several factors impact the required amount of time. Recipe complexity will impact how much time it takes. If you need to chop, dice or sauté the food, it will take more time than if it’s a dump it and forget it. The type of kitchen appliance used for cooking will impact the time required. A slow cooker, Instant Pot, Stove or Oven all require different investments of your time. So, let’s look at 6 different approaches to batch cooking. We’ll go from methods that are the least time intensive to those that require the most preparation time. Passive cooking is a beautiful thing! It’s exactly as it sounds…passive. You cook large quantities of staples your family eats WHILE YOU’RE DOING OTHER THINGS. Isn’t that lovely?!? Then, depending on the quantity of food you make, you either store it in the refrigerator or freezer. Baked potatoes or baked sweet potatoes are great for passive cooking. You can rinse them and then set them in the oven or Instant Pot and forget them for 30 minutes to an hour while you focus on something else. The key to making this batch cooking is that you cook enough potatoes for your family for a week. Rice, quinoa, black beans are other examples of things you can passively batch cook for your family. In the case of grains or beans, you don’t have to eat them the same week that you cook them. Just store in packages or 2-4 cups, or whatever amount your family typically eats at one meal, and freeze for when you need them. Doubling recipes is another EASY option for batch cooking. It takes minimal additional time but could save you 30 minutes to an hour down the road. If you’re making chili, spaghetti, or a casserole, just double or triple the recipe and freeze the rest for another meal or two at a later date. Another twist on batch cooking is to prep your ingredients in advance. In this case, you dice the onions, peel the carrots, chop the bell peppers etc. and store them until it’s time to cook. This option doesn’t require as much time up front but will require more time at dinnertime than the other options. It enables you to cook meals quicker with less hassle, but cooking at dinnertime is still required. 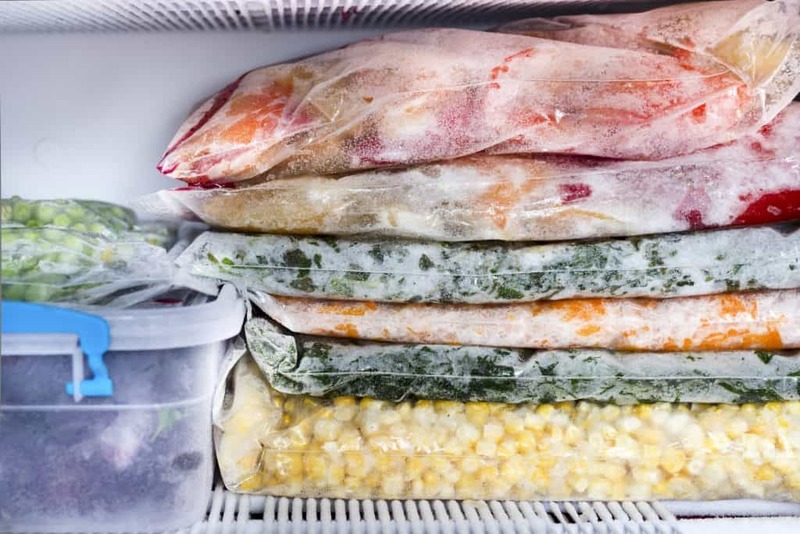 With this approach, you dump all of the ingredients into a Ziploc and freeze it. When it’s time to cook, you empty the frozen contents into a slow cooker and set it to cook for the specified time. This was a huge help when we were expecting our second child. A week or so before the due date, I prepared 3 batches of 3 different recipes in less than an hour. We had 9 meals that were ready to place in a slow cooker in the coming weeks. So, we’ve discussed 4 batch cooking methods that require very little time commitment. The next two options are more of an upfront time commitment, but there’s a bigger pay-off in the end. Weekly batch cooking requires you set aside 2-3 hours and cook 3-4 meals for the week. Then, when dinner time comes, you simply heat up the meal you prepared in advance. Typically, you don’t need to freeze the meal if you eat it within the next 5 days. There are exceptions to this e.g. fish! Weekly batch cooking saves you on the weeknight but requires some time, often over the weekend, to cook all of your meals in advance. Let me vouch for it though, it’s totally worth it!!! It is so nice to get home and only need to heat up your meal. Monthly batch cooking is the same concept as weekly batch cooking, but instead of cooking 3-4 meals, you’re cooking 12-16 meals. Obviously, you’d need to freeze the majority of the meals, since it could be over 3 weeks before you need them. I haven’t personally used this approach but I have friends who have. They set aside one day to do all of their cooking and they make it a “cooking event” with their Sister, Mom, or other friends. They make huge recipes and divide it among the families involved. While I haven’t tried this…I must admit, it does sound fun! 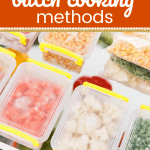 If you want to try any of these batch cooking methods, decide what approach you want to take and make a plan. 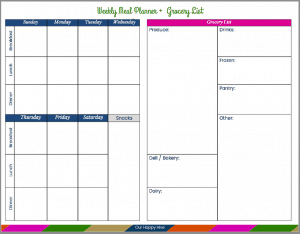 Start by downloading my free Weekly Menu & Grocery Planner in the Free-Bee Library (Look for the free subscription form at the end of the post). If you want to do passive cooking or doubling a recipe, choose your recipe(s) and go for it. If Weekly Meal Prepping interests you, just identify the items from your week’s recipes that need advanced prep. Remember…prepping is the dicing, chopping, and peeling that can simplify the dinnertime process. Check out Pinterest for some great Slow Cooker Freezer Meals. If you’re going to try weekly or monthly batch cooking, try to identify recipes that have common ingredients so that you can simply the ingredients and the process. There are some really simple ways to begin to batch cook. Several batch cooking methods require minimal time up front, yet can have a big impact on relieving some of the dinnertime stress. Take advantages of all of the modern conveniences when you choose your recipes. Choose easy recipes that allow you to use your slow cooker or pressure cooker (Instant Pot) so that you can optimize your time. Finally, choose the batch cooking approach that’s best for your family. It’s not a one size fits all and there are many approaches to batch cooking. Regardless of the method you choose, any steps you take to prepare food in advance of the dinnertime will help reduce stress, encourage healthy eating, and help you make the most of this precious time with your family! Bon Appetite!